Add-in for Visual Basic 6.0 to make advanced menu! Menu Creator is a VB 6.0 add-in that work with another ActiveX DLL to subclass menus: MenuExtended.dll and, as you see on image below, is used to create your menu without writing any line of code (like as VB 6.0 menu Editor). But Menu Creator adds a couple of features in your menu! In fact, you may indicate two properties for each menu item: Image and Description. As you see, the building of your menu is very simple! The MenuCreator_Setup installation install MenuExtended.dll and related files, too. See Menu Creator Download page for more details. Support for menu array: when you start or set the item as a menu array, all next item will be indexed automatically. More languages: You may use Menu Creator in your language. Choose your preferred language from Italian, English , French, Deutsch, ecc.. If there not your language you can add it, is it a simple text file (LNG). Easy and quick: you don't have to write any line of code! You do not believe to us ? Try it!!! Fully manage menu items: with the arrow buttons, you can move a item as you want (up, down, left, right) to create your menu structure. Templates: you can save, and reload later, your menu structures, so you don't have to re-create each time your menu. You can load a saved menu structure, modify and re-save with another file name. You can set the templates folder you prefer; default is the Visual Basic Templates folder (normally C:\Program Files\Microsoft Visual Studio\VB98\Templates). Automatic building of menu and code: once you have created your menu with Menu Creator simply click on Make Menu button and in your project will be build the menu (based on the structure you have set) and all the need code will be automatically added (declarations, functions call, etc.) and a refer to MenuExtended.dll. Remeber: the core of all is MenuExtended, not Menu Creator! Automatic reloading last menu session (optional): You can reload automatically the last menu you have worked on during the last Menu Creator session. Menu Creator asks first whether to load it. Is it quickly and easy to capture menu from any EXE/DLL or RM file, then you can modify the whole menu structure, last add or update the menu in your form. Great! Now you have access to ALL item properties: you can change or set Checked, Enabled, Visible and WindowList properties (just like the standard menu editor). Favorites menu: you can save your favorites menu structure, and reload them with a simple click! Now you can use MC to make and manage normal menu (without image, description, etc.) this mean that you haven't to use MenuExtended.dll for subclassing menu. The new option Prepare project for MenuExtended.dll (menu Options) allow you to choose to make a normal VB menu, or a enhanced menu for MenuExtended. Q. Menu Creator don't start! How to? A. The MenuCreator.ini file it's corrupt. Delete it! Next, Menu Creator will re-create a new one. Q. My menu show icons on 32x32 format, instead of 16x16. How to? A. Your icons contains more image formats: 16x16 + 32x32 + 48x48 and so on... You must remove the others image formats from you icons, that should be only the 16x16 format! You must use a icons Editor (like Microangelo Studio or Axialis Icon Workshop) to edit your icons. Or, if like you, download my icons 16x16x256 colours. (identical) MenuCreator change the name by add a suffix to the Name property. Previously, MC say "Menu already exists" and stop the updating! - If a menu is captured from a Visual Basic FRM file all the 'state' properties like Visible, Enabled, Checked and WindowList will be acquired from file. EXE: Name property will build by combine the Parent caption + Item caption, last will add 'mnu' prefix. FRM: each item will keep the same Name property as appear on source FRM file. - Then max chars allows by Visual Basic for the Name property is 40. Excess chars will be removed! Note: if the removing cause two or more items with same 'Name' property, Menu Creator cannot complete the menu building and stop. In some cases the menu may be corrupt. Sorry for this but Menu Creator cannot set by self what string to change or use. Only you can decide for this. - In some cases the Name property was not processed correctly: sometimes a char was missing, sometimes not allowed chars will include. from other applications or files. You can capture menu from EXE,DLL and FRM files. The FRM files contains one menu structure only. structure as Menu Creator template (.MCT). default Menu Creator template folder. "Normalize all menu item state"
the menu will be created. can add, remove and open your favorites menu. original path for the file was modified. Now the original path is keeping. - Updated languages files (LNG). Their will be displayed on english language. BAS file inside ALL projects. node this error was occur. the Form, the related FRX file is NOT deleted. You must delete FRX file directly. - In a 'rare' situation Menu Creator can't retrieve the images. - When a new item is add, image and description was not reset. - item is disabled, because this feature isn't complete! The menu already processed by Menu Creator, and later imported, wasn't imported correctly and the images wasn't retrieved! The chars control for Caption property has been removed, because this control cause some problem with users that want to uses special chars. If the selected ImageList contains bitmap images format 'only' an error occur, Menu Creator is stopped and VB give out a Automation Error. Some users with Visual Basic other than Italian version was not abel to start Menu Creator! This problem is now correct. This problem is due to the different VB language versions which write boolean value on different way. Thus all the settings on MenuCreator.ini with boolean values was not ready correctly in VB language other than italian. Now, all the boolean values is registered with 1 (True) or 0 (False). If add a separator as the first separator of a menu level, the Name property wasn't updated correctly. In some cases, image "none" wasn't loaded. As the result, some menu items of the root level may show a icon. If remove 'mnuFileSep1', mnuFileSep2 stay with the same name mnuFileSep2 while the Name should be mnuFileSep1! Menu Creator does not warning if menu is changed (i.e. if a item is removed). Note: even if you save the menu as Template the previous condition don't change: the menu must be saved! Sometimes if you set a item as Separator the property Name was not crrectly updated. If the ImageList control contains Bitmap image other than Icon image, Menu Creator was stopped to read image. Now simply skip the bitmap and continue to retrieve the Icon image. With the Automatic option (naming) active In some cases the Name property wasn't correctly builded. This is a serious error. Please update!!! Error 35: sub o function not defined. This version corrects the bug. Added support for menu array. You can import a existing menu already processed with Menu Creator, even without its file name. Menu Creator retrieve all the settings from code directly! Ask confirm when you close Menu Creator window. When Menu Creator opens, it informs you if the project has already been processed previously with Menu Extended. When you open Menu Creator your project is automatically saved. Now the MCT files is saved to the project folder, no longer to the template folder. This solves the problem that occours when there is more than one form with the same name belonging to different projects. 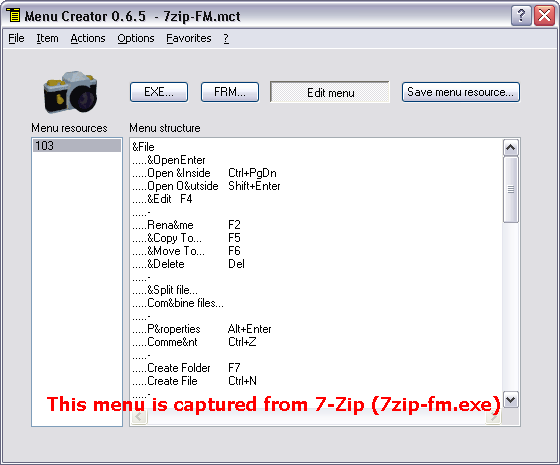 The name of the MCT file is set by Menu Creator with the name of the form filename (previously Name property was used). Now the Menu Creator windows stays on top only to the Visual Basic window environment (never stay on top to all applications). Also, when you minimize the Visual Basic window the Menu Creator window is hide. Languages file (LNG) is updated. Note: the autonaming feature, however, ignores all the non-valid chars (all but a-z, A-Z, 0-9, and the underscore). Eliminated the window "flickering" bug, which occur while the menu was created or updated. Now you can set the Shortcut property within Menu Creator as well as you do on VB Menu Editor. If you choose a shortcut already used, Menu Creator warns you. Also, there is a new button to reset the shortcut for current item. So, you don't havr to look through the combobox just for reset shortcut. If the current project doesn't contain any Form or MDIForm, you receive a warning message. If a multi-project application, if the selected selected form isn't the first project on the list in VB Project Explorer, you get a <Run-time error '9'>. Next, when you close Menu Creator and VB IDE, you may be get a <Automation error>, which force you to reset all VB IDE CommandBars, Menus and Tools. Menu Creator no longer use the "_img" suffix for the name. Now all files is processed at the same way. If a VB form contains two or more ImageList, and a ImageList is empty, by choose the empty ImageList the ImageCombo it did not come emptied, and if previously contained other images, its stay loaded. Now, if ImageList is empty, will come shown a warning message. Npw, the Name for separator item will generate correctly (with Automatic option is actived). When disable AlwaysOnTop options, Menu Creator stay on top. If you press the "-" char to make a separator item, while Automatic is activated MC don't accept any key. The BAS module "modMenuEx.bas" since now will be 'created' directly from add-in, even if this file isn't existing on the "\support_files\" subfolder of the installation Menu Creator folder. Moving a item to the 1st level (left) a image is displayed, instead the menu-bar item can't have a image. In some cases a message indicating that a Key value for one o more images is missing will be displayed. This is because a ImageList control not contain a "none" image, and this is add by Menu Creator. Due to my error, the previous version 0.2.1 no longer create the "modMenuEx.bas" file. Correct. On changing of language the version number and the current file name no longer show on title bar. - NEW: Now it's possible modify a 'Imported Menu' simply import a menu as normally was does on the previous version. Warning! The existing menu will be deleted and replaced from the new version modified in Menu Creator. - FIX: If the Automatic option is checked, changing the indentation level of a item automatically will change consistently the Name property. Previously was necessary re-edit the Caption property to conform for the new parent. - FIX: Sequence TabIndex controls is now correct. - FIX: Changing indent level of item with sub-items, them was deleted. - FIX: Can't no longer move Items with sub-items. NOTE: This version it's the Beta - pre-release version and it's the first version public release. - NEW: Add support multi-language (italian + english). - NEW: Add help-context english language. - FIX: intercept the error when Name property is missing. In this case will be assign a temporary Name value, which must to be modified later. - FIX: Predefined Description string no longer add when add a new item. - FIX: Now is check for duplicate Name property. - FIX: MenuCreator keep on memory all menu after creating, with the results that next creating will assemble two menu: the previous and the current one. - FIX: On change menu item Caption of 0-level (menu bar) the Description property was enabled. - NEW: Check either open and close if the project is saved. If not display a messagebox. - NEW: Name property accept now only alphanumeric chars and underscore (_) char. This prevent many error. - FIX: Eliminato il problema delle Caption doppie, che si era di nuovo ripresentato: (es. "mnuFile|File" creava una caption "File|File"). - FIX: Quando si premeva un tasto nel campo Caption di un menu sulla barra, il campo Descrizione veniva erroneamente abilitato. - FIX: Se si crea o aggiorna lo stesso menu piu' volte durante la stessa sessione, il codice negli eventi: Form_Load, Form_Unload, MDIForm_Load e MDIForm_Unload venivano inseriti piu' volte. - FIXED: Se il form contiene solo il controllo ImageList e nessuna riga di codice, veniva generato un errore. - FIXED: Il tasto Enter funziona come il tasto TAB, premerlo per passare al campo successivo. - NEW: Ora quando si seleziona il form dal combobox Form, questo viene visualizzato. In questo modo si ha la certezza di aver selezionato il form corretto. - NEW: E' stato aggiunto un controllo per evitare di duplicare nomi di controlli (proprieta' Name). Ora, se si indica un Name ed esiste gia' un altro controllo con lo stesso nome, viene segnalato con un Beep e il campo viene azzerato. - FIXED: Risolto il problema che nei controlli con nome uguale creava le caption doppie (es. "mnuFile|File" creava una caption "File|File"). - FIXED: Eliminato il beep quando si preme Invio nel campo Name per passare al campo Descrizione. - NEW: Quando il primo carattere nel campo Caption e' un trattino (-) e quindi significa che e' un separatore, il campo Descrizione viene automaticamente azzerato e disabilitato, perche' un separatore non puo' avere alcuna descrizione. scrive nel progetto e' diminuito perche' non piu' necessario. so you can modify it, and update it. users can to use to customize they menu. This is the First version Released to public! - Create only the new menus.